Dernière modification par Eyeshield21 le 08 juin 2018, 11:51, modifié 3 fois. in the hobby largely by being many things to many collectors. For some, it’s all about the Mirror parallels. For some, it’s the fabled Fabric of the Game memorabilia insert. For some, it’s the hard-signed rookie autographs every year (but especially this one coming up). the outlook is promising yet again for the upcoming 2017-18 Totally Certified. and will deliver, on average, one autograph and one memorabilia card. 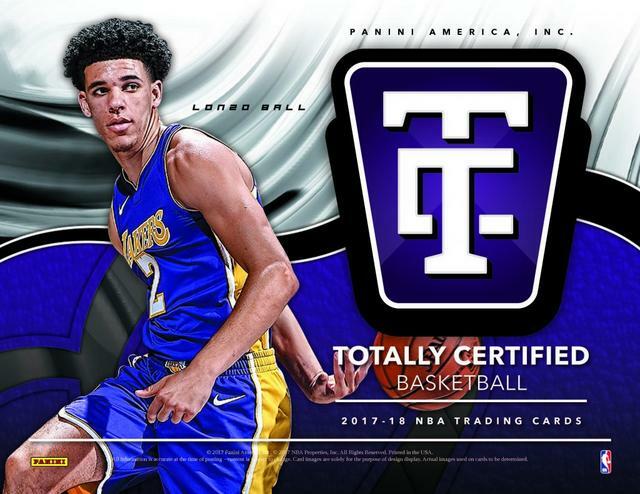 Heavy on the background designs and effects, 2017-18 Totally Certified is totally the place to look for some of the crazier NBA cards. Each hobby box averages one autograph and one memorabilia card. and with 2017-18 Panini Totally Certified Basketball, there is the potential for some big pulls along with some hard-signed ink. Releasing in time for the holiday season, Certified boxes will have one autograph and one memorabilia card inside. with lots of content featuring members of the hotly-anticipated 2017 rookie class. applies a spectrum of colors via parallels such as Gold, Green and Holo Blue. a spray-paint design that really catches the eye. and up-and-coming rookies on etched foil stock. with some being serial-numbered to as low as one-of-one. to have at least one collection that will have people talking. and will focus on the new rookie class. with quantities as limited as one-of-one. to the incoming draft class with hard-signed options. Other autograph hits include Choice Signatures and Signed, Sealed, and Delivered. Continuing the established relic insert, Fabric of the Game contains memorabilia swatches. for two young stars, including a pairing for top overall picks Lonzo Ball and Markelle Fultz. in 2017-18 Panini Totally Certified. to be very hot and those cards are limited to 25 copies or less. and Camo that help make up the rainbow collectors can chase. - On-card autographs from the best and brightest stars of the 2017 NBA Draft class. and including star-studded combinations like Markelle Fultz and Lonzo Ball. - Fabric of the Game returns showcasing memorabilia from the NBA’s top rookies and veterans. and featuring only the best 2017-18 rookies. - Search for base card, Rookie Card and insert parallels numbered as low as only one. - Autographs from veterans and legends alike in Choice Signatures and Signed, Sealed, and Delivered. Other autograph collections that focus on NBA veterans and legends will also be placed in packs. One memorabilia set was also revealed on the sales sheet in Fabric of the Game. In addition to a standard version, there are several levels of prime parallels which include Holo Blue. - Look for stunning on-card autographs from the best and brightest stars of the 2017 NBA Draft Class! - Chase rare multi-signed rookie autographs (#’d/25 or less), including star-studded combinations like Markelle Fultz and Lonzo Ball. - Find iconic Fabric of the Game memorabilia cards that showcase the NBA’s top rookies and veterans! - New in 2017-18: Pull the dazzling 2017 insert emblazon with colorful spray-paint designs and features only the best 2017-18 rookies. - Search for Base, Base Rookies and insert parallels numbered as low as one-of-one! numbered as low as one-of-one! and brightest stars of the 2017 NBA Draft Class. and Signed, Sealed, and Delivered. Chase the new 2017 insert, featuring an eye-catching spray-paint design. Pull iconic Fabric of the Game memorabilia cards, including multiple level prime parallels. - Multi-Signed Rookie Autographs – #’d to 25, featuring star-studded combinations like Markelle Fultz & Lonzo Ball! - 1 Memorabilia Card in Every Box! - Fabric of the Game – Iconic memorabilia cards of the NBA’s top rookies & veterans including multiple levels of prime parallels! - NEW! – “2017” Insert – Emblazoned with an eye-catching spray paint design and featuring only the BEST 2017-18 rookies! - Chase down stunning Base and Base Rookies parallels, numbered as low as one-of-one! We’ll have much more on 2017-18 Totally Certified in the coming weeks right here. Dernière modification par Eyeshield21 le 13 mars 2019, 12:28, modifié 3 fois. The vibrantly colorful world of Panini America’s Totally Certified franchise is totally ready for another run. with its normally intoxicating brand of Mirror parallels and on-card rookie autographs. to a landmark class of rookies. will deliver one autograph, one memorabilia card, one Rookie Card, four Mirror parallels and three inserts. Dernière modification par Eyeshield21 le 08 juin 2018, 11:48, modifié 2 fois. 2017-18 Totally Certified Priority Mail Set Checklist 5 cards. Is Panini America’s Totally Certified Basketball franchise ready once again to rock the hoops collecting universe? Totally. will do just that with a new-look base set, those same enchanting Mirror parallels and a robust roster of hard-signed rookie autographs. We brought you an extended introduction to this year’s product with yesterday’s Quality Control Gallery. Today, we taking you pack by pack through five early boxes with a must-see Teaser Gallery. one memorabilia card, one Rookie Card, four Mirror parallels and three inserts.